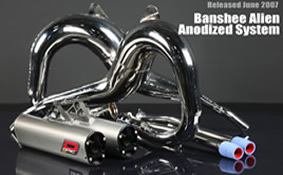 The new Banshee Alien with anodized mufflers and black endcaps is a complete system that features 2 standard chrome plated expansion chambers, midpipes, and mufflers. This system delivers a 25% gain in horsepower, 20% gain in torque, and a weight savings of 6.2 pounds compared to stock. DMC has created a twin system that turns this 'lil angel into a 'lil monster! The twin exhaust for the Raptor 250 performs exceedingly well, delivering smooth and controllable power at every stage of the powerband. 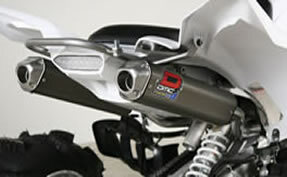 The DMC Quiet system is the perfect choice for the track or the trail. Designed to improve the spread of horsepower, torque and acceleration while keeping sound down. 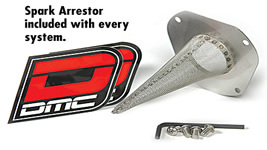 These closed course race systems utilize the latest DMC technology to deliver big gains in acceleration, horsepower and torque throughout the entire power band. This System delivers on its promise of horsepower and torque! After all, that's what it's all about! 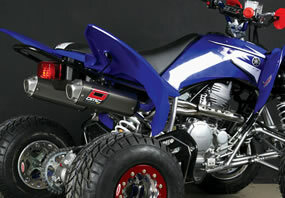 The new Raptor 700 has been designed, tested, and track proven to blow away any aftermarket exhaust. With torque rolling in at a 31% lb/ft increase and horsepower screaming across the finish line with a 24% increase. 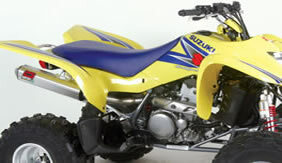 Like the 2-stroke pulse chamber, scavenging is maximized with the twin megaphones, delivering maximum engine efficiency. 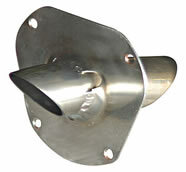 The reverse cone of a megaphone “times” the negative wave pulse reflection to correspond with the period of valve overlap. Large diameter max-flow individual headers are easy to install and mount on each side of the Raptor, with the entire system tucking neatly inside the frame rails. 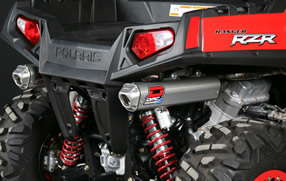 The DMC Twin system packs a huge performance punch to the already potent RZR800. 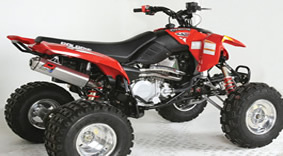 Twin muffler design increases total exhaust volume for big top end horsepower while maintaining maximum exhaust velocity for low and mid range torque. With torque rolling in at a 21.2% lb/ft increase and horsepower increased a whopping 17.8%. For Afterburner exhausts. Stainless steel cap installs easily. Comes standard on Quiet systems. 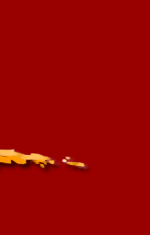 Reduces Comp system sound level. 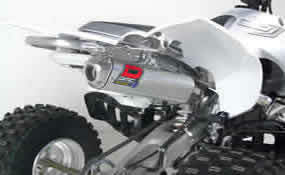 Stainless steel, swivel head springs with DMC logo sleeve protects your springs. 63mm, sold in pairs. Packing, screws, and allen head wrench included. 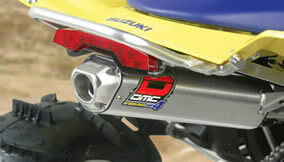 The DMC Power Chip increases the LT-Rs RPM ceiling by 1000 RPM over the stock limiter. 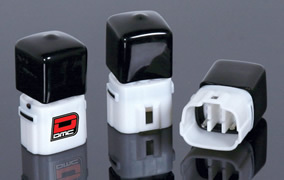 The DMC Power Chip installs in less than 2 minutes and simply plugs into the LT-R's diagnostic port. It also reduces the OEM fuel map restrictions to maximize engine performance. REV MAX AND ADJUSTABLE REV MAX CDI BOX'S. Improving both the bottom end and mid-range performance and giving an extra 750-1000 revs at the top, the Rev Max will unleash the potential of your engine and is highly recommended for maximizing performance when inlet and exhaust modifications have been made. 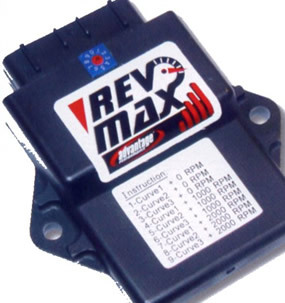 The Adjustable Rev Max which is avail for a select few models will allow you to choose from 3 ignition curve settings each with 3 redline options form std to +1000 and +2000. 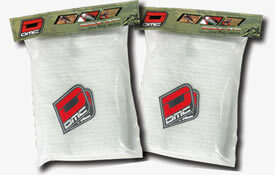 The exclusive DMC fuel map optimizes air/fuel ratio at all RPM’s for maximized throttle response and horsepower. 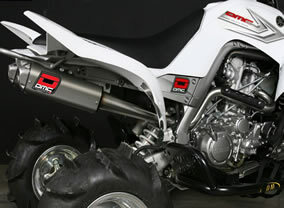 The DMC EFI Control Unit offers more advanced settings than any other brand.